2017 Volvo XC90 Curt Trailer Hitch Receiver - Custom Fit - Class III - 2"
2017 Volvo XC90 trailer hitch from Curt. Product reviews from other XC90 owners. Expert trailer hitch advice with thousands of helpful questions and answers. Guaranteed lowest price and fastest shipping. 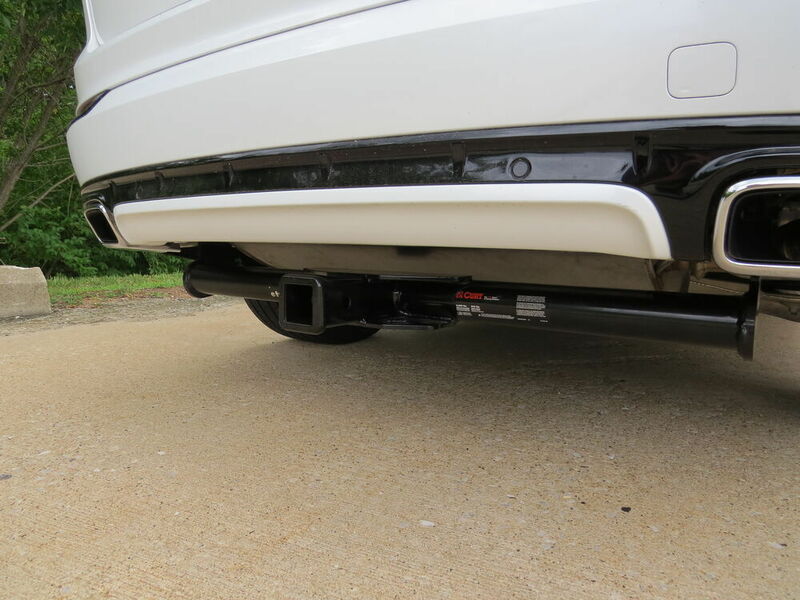 2017 Volvo XC90 - Curt Trailer Hitch Receiver - Custom Fit - Class III - 2"
This fully welded trailer hitch receiver bolts onto your Volvo XC90's frame with no welding required. Powder coated steel is sturdy and corrosion resistant. Note: All non-trailer loads - bike racks, cargo carriers and so forth - should be supported with stabilizing straps. Failure to properly support these loads will void your hitch warranty from Curt. 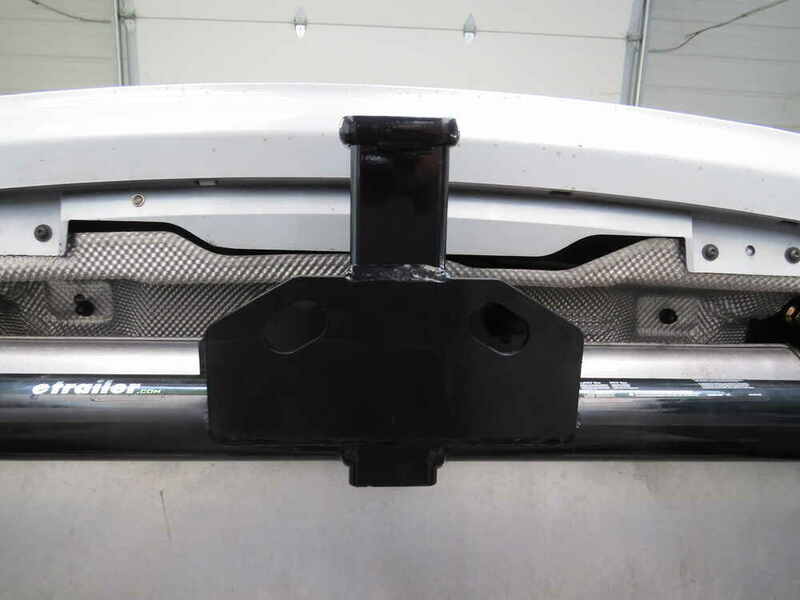 Video of Curt Trailer Hitch Receiver - Custom Fit - Class III - 2"
Speaker 1: Today, on our 2016 Volvo XC90, we're going to be taking a look at and showing you how to install the Curt class three custom fit trailer hitch receiver, part number C13233. Here's what our hitch looks like fully installed. The cross tube is going to be visible and it's going to sit right below our bumper. Now, it is a class three hitch, which means it's going to give us that 2-inch by 2-inch receiver tube opening, and it does have a reinforced collar, giving it added strength and a nice, clean finished look. 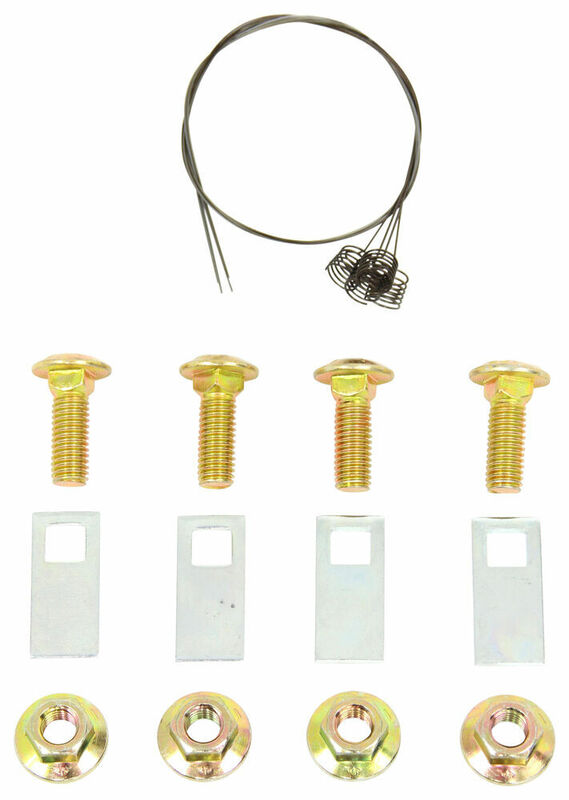 Our hitch is going to use a standard 5/8 pin and clip, it's not included, but you can pick one up on our website using part number PC3. Now, as far as the safety chain loops go, it's going to be a plate style, welded to the bottom of our receiver tube. As you can see, we're not going to have trouble getting most sized hooks on or off.Our hitch is going to feature a 900-pound tongue weight, along with a 6,000-pound gross trailer weight rating. Now, I do want to recommend that you always double check your vehicle's owner's manual to make sure it can handle that amount of weight. Now, Curt does recommend using a safety strap when carrying any non-trailer loads, such as a bike rack or a cargo carrier. Now I'd like to give you a few measurements that will help you when deciding for accessories for your new hitch, such as a ball mount, bike rack, or even a cargo carrier. From the center of the hitch pin hole to the outermost edge of the bumper, it's going to be right about 5 1/2-inches. Now, from the ground to the inside top edge of the receiver tube opening, that's going to be right about 12 1/2-inches.Now that we've gone over some of the features and details, let's show you how we got the hitch on. To begin our installation, we're going to need to remove the bolts that are holding our lower fascia to the inner part right here. We're going to have four fasteners, two on each side. Now, I'm going to be using a T25 torx bit to remove those fasteners. We'll go ahead and remove the other two on the other side as well. 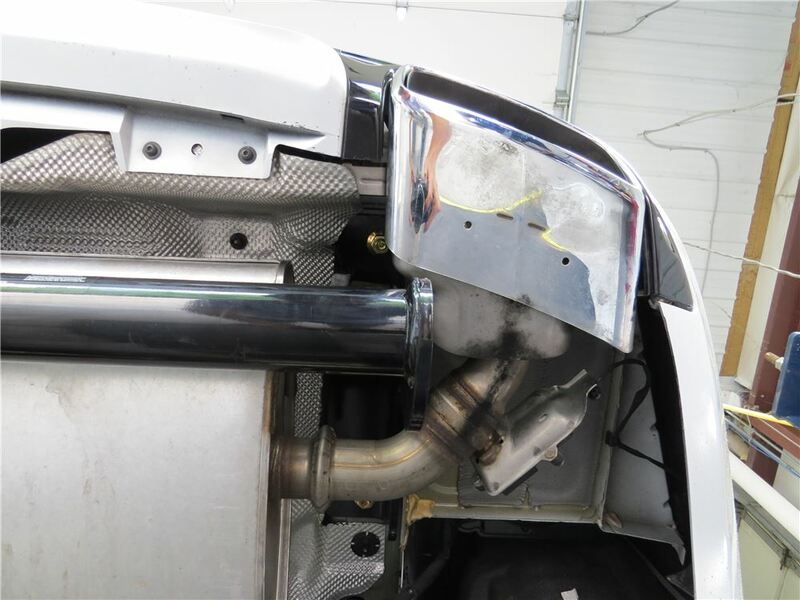 We are going to need to remove the trim that goes around our exhaust that's attached to our bumper. If we come right to the edge here, towards the center, and we look up where the heat shield is, we're going to have a fastener holding it in place. I'm going to be using a T15 torx bit to remove that bolt. We're going to have one more that's holding this on, that's going to be on the very outside edge going straight back. That's also going to be a T15 torx bit to take that bolt out.Now when we go to remove this, it is loose, but we're going to have to work at it a little bit to make sure that it comes loose and everything is disconnected. We just slide it back, and we should be able to slide it out. We're going to go ahead and repeat that for the other side as well. We are going to have to lower our exhaust down, but I don't want to just let it hang, so I'm going to take a strap here to help support it once we take it off. 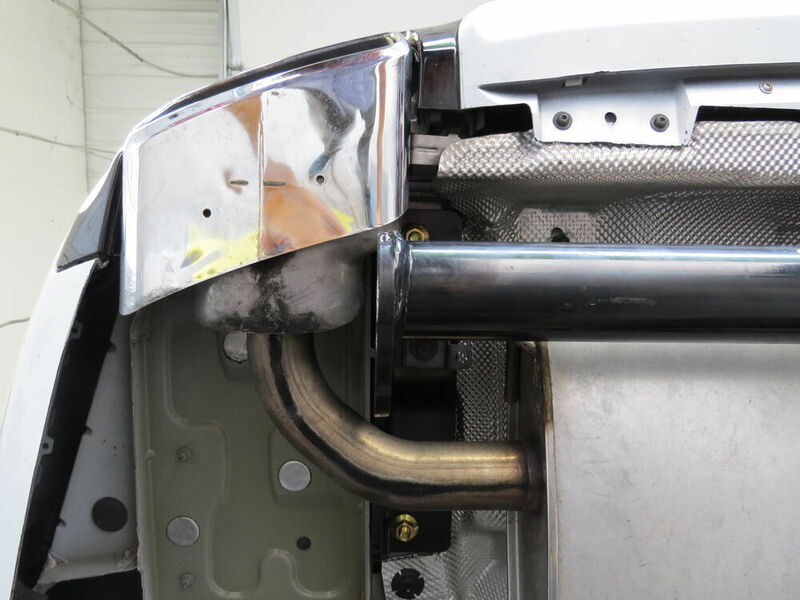 Now on each side of our muffler, we are going to have a hangar with a rubber isolator on it. If we look straight up past the isolator, we're going to see an M10 bolt. I'm going to be using a 13-millimeter socket, and we're going to go ahead and remove that bolt. 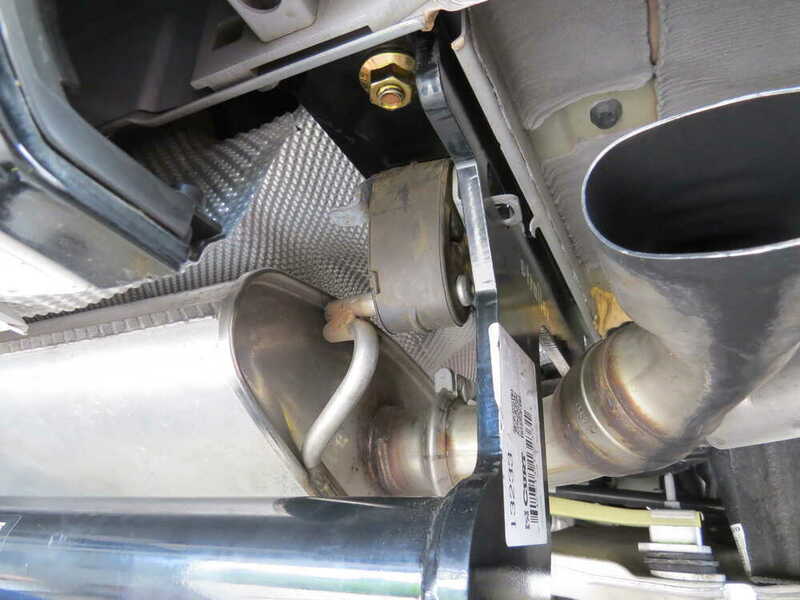 Now that this side's removed, we're going to go ahead and remove the other side as well.Now, just right above our muffler, we're going to have our heat shield. We are going to need to temporarily remove this. On each side, we're going to have three fasteners holding it in place, one towards the very back, one more towards the front of the vehicle, and then one at the very edge that's going to be kind of hard to see. They're all going to be 10-millimeter fasteners, I'm going to be using a 10-millimeter socket to remove them. Now that we have this side removed, we're going to go ahead and take the other ones out on the other side. In order for us to reinstall our heat shield, we inaudible 00:03:59 going to trim it. I already marked out where we're going to need to trim. The measurements are in the instructions. We're just going to cut along this line. Now that we have this side cut out, we're going to go ahead and do the same thing and cut the other side out as well.Now, on the driver's side here, you're going to notice that it's shaped slightly different. This hump right here in this rectangular area, we are going to cut around that instead of going straight across. With our heat shield trimmed, we can go ahead and put it back in place. On your XC90, it may work with the heat shield being trimmed per the instructions, but on our particular application, we're going to have to take that line that we cut, and we're going to have to go all the way to the edge of the frame and follow it down so that we can have room for our hitch to come in place. I'm just going to follow this line, so I'm going to be cutting off all of this section here. With an extra set of hands, we're going to grab our hitch and we're going to put it in place. The bolts that we removed from our muffler, we're going to be reusing those just to get our hitch in place. We're going to get our bolts in place.Right now, we're just doing this so we can mark the holes for the other two locations that we're going to be putting our hardware in place. I'm going to go ahead and take a marker. I'm going to reach all the way through the hole on my hitch. I'm going to mark a hole where I'm going to drill it in my frame. We're going to do that for the other side as well. With the holes marked, we can go ahead and take our hitch back out and set it aside for now. I'm going to come back with a somewhat small drill bit, and I'm going to drill a pilot hole on the locations that I marked. I'm going to come back and the final hole size is going to be a 9/16. To make it a little bit easier, I'm going to start out small and keep getting larger. I'm going to come back with a 9/16 drill bit and enlarge the hole. Now, for the forward most hole, the one that we marked earlier, there is a small hole in there. We're going to need to drill it out large enough to get our hardware in place.Now, it's roughly going to be about an inch, maybe an inch and 1/8 that we're going to have to drill it out, but we want it big enough just so we can get our hardware in place. I'm going to be using a step drill bit. Periodically, I'm going to stop drilling and check to see if I can get my hardware in. Now that I know that my hardware can fit, the hole is definitely enlarged large enough, and we'll go ahead and repeat that on the other side as well. The farthest back hole, we're going to start there and we're going to take our fish wire, and we're going to take the coiled end and then we're going to start feeding it through. We're going to want to have it come out the hole we just enlarged. If inaudible 00:07:02 put a small bend by the end with the coil in, it should pop right out.Now that the coil end's sticking out, we're going to take our spacer block, and we're going to slide it over the coil. Then we're going to take our 1/2-inch carriage bolt, and we're going to thread it onto the end of it. Once we have the bolt threaded all the way on, I'm going to take my block, I'm going to push it back up into the frame and push it back a little bit so that the bolt won't touch it. Then I'm going to push my bolt up into the frame. I'm going to pull my pull wire and have my bolt drop out right here. Now, for the forward most hole that we just enlarged, I'm going to take my spacer block, and I'm going to slide it over the coiled end. Then I'm going to take my 1/2-inch carriage bolt, and I'm going to thread it onto the end of the coil. I'm going to take my bolt, push it up into the frame and then push my spacer block into the frame and then let my bolt drop down, just like that. Now, we're going to repeat that process for the other side as well.With an extra set of hands, we're going to get our hitch put in place. We're going to take our pull wires, and we're going put them down to the holes corresponding in the hitch. We're going to slide our hitch into place. We can secure it down with a 1/2-inch flange nut. Now, when you're putting these on, you want to be careful not to push the bolt back up into the frame because we are going to have to remove the pull wire to get the bolt on. We'll go ahead and repeat that process for all the remaining hardware. Our muffler's going to attach using the factory M10 bolts. That's going to go right on the outside of our hitch, so we can raise it up and reinstall the hardware. With that bolt started, we're going to go ahead and do the same thing on the other side as well. I'm going to come back and snug up all my hardware. For my exhaust hangar bolts, I'm going to be using a 13-millimeter socket. For my carriage bolts, I'm going to be using a 3/4-inch socket. We're going to repeat that for all the remaining bolts.Now I'm going to come back, I'm going to torque all my hardware to the specified amount in the instructions. Again, for my carriage bolts, I'm going to be using a 3/4-inch socket. I'm going to repeat that for all my remaining hardware. We can go ahead and start putting our exhaust shield back in place. 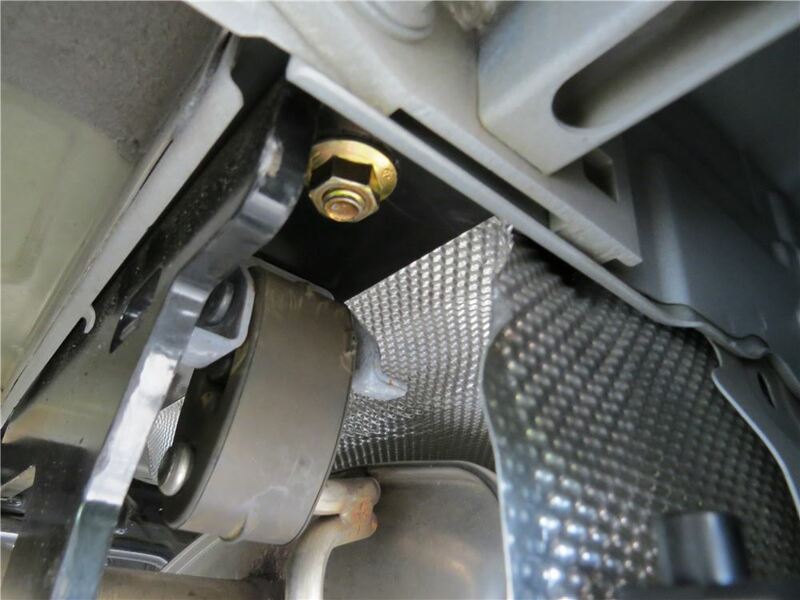 Finally, we can put the screws back in place holding our fascia to the bottom of our vehicle. 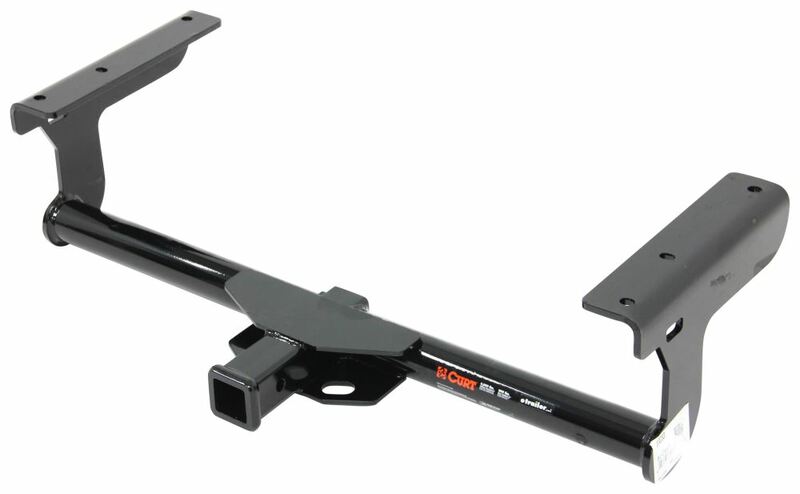 That'll finish up our look at the Curt class three custom fit trailer hitch receiver, part number C13233 on our 2016 Volvo XC90. 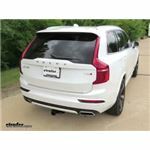 Both the Curt hitch part # C13233 and Draw Tite hitch part # 76194 are a confirmed fit for your 2017 Volvo XC90. They are made by two different manufacturers who approached the design of the hitch totally different but they both fit and work well. That said the Draw Tite is the better option since it has a concealed crosstube and all you'd see is the hitch opening from behind the vehicle. I attached an install video for this hitch for you to check out as well. 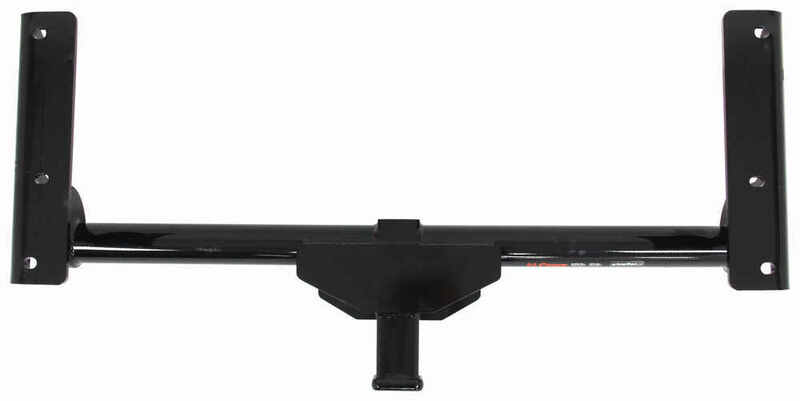 The Curt Trailer Hitch # C13233 fits all models of the 2017 Volvo XC90 so you will not have any problems with fitment on your air ride model. I have attached a sample installation video as well as the instructions for you to reference. If you let me know what you will be using it for I can make additional recommendations if necessary. For your 2018 Volvo XC90 we have the Curt hitch part # C13233 as your best option. It does require some heat shield trimming but does not require any rear bumper trimming. Check out the install video I attached for more info on that the Draw Tite hitch that fits your vehicle on the other hand does require bumper trimming. 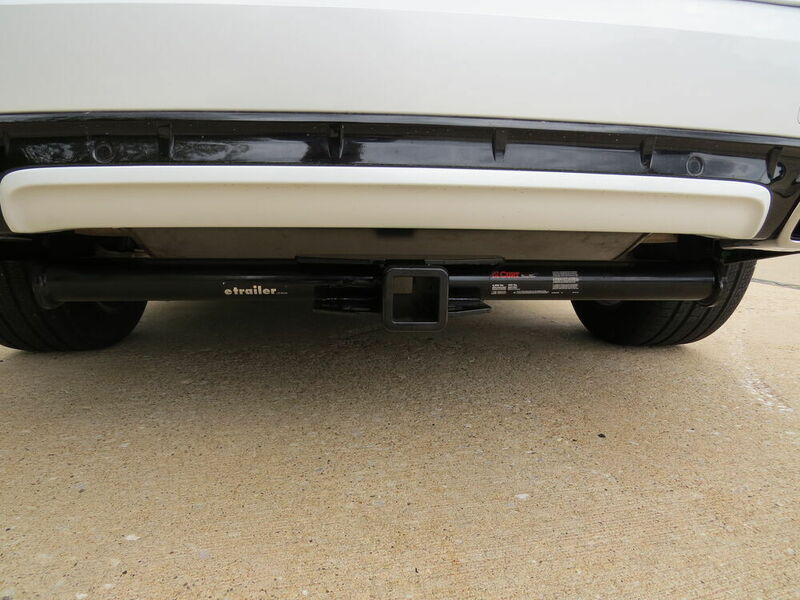 Is There A Trailer Hitch Receiver For A 2017 Volvo XC90 That Doesn't Require Cutting Bumper? 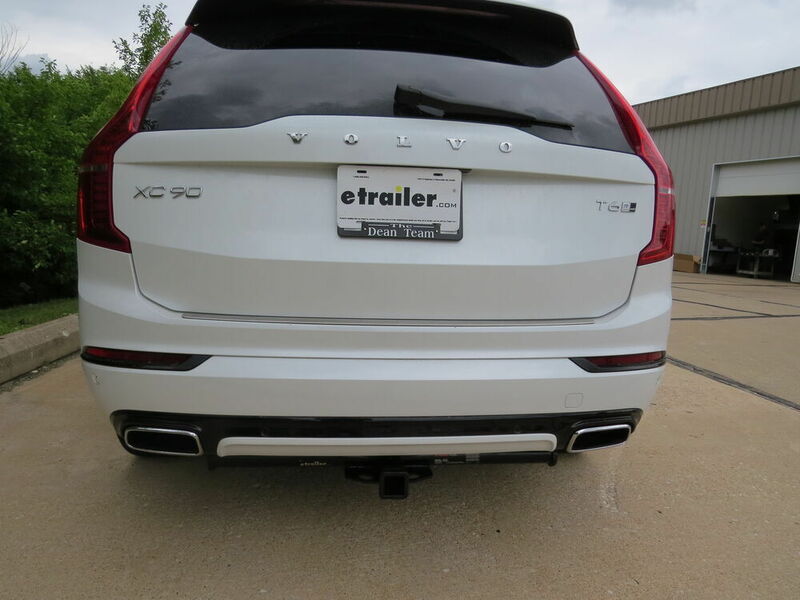 For your 2017 Volvo XC90, the Curt Trailer Hitch Receiver - Custom Fit - Class III - 2" # C13233 does not need to have the rear bumper cut. 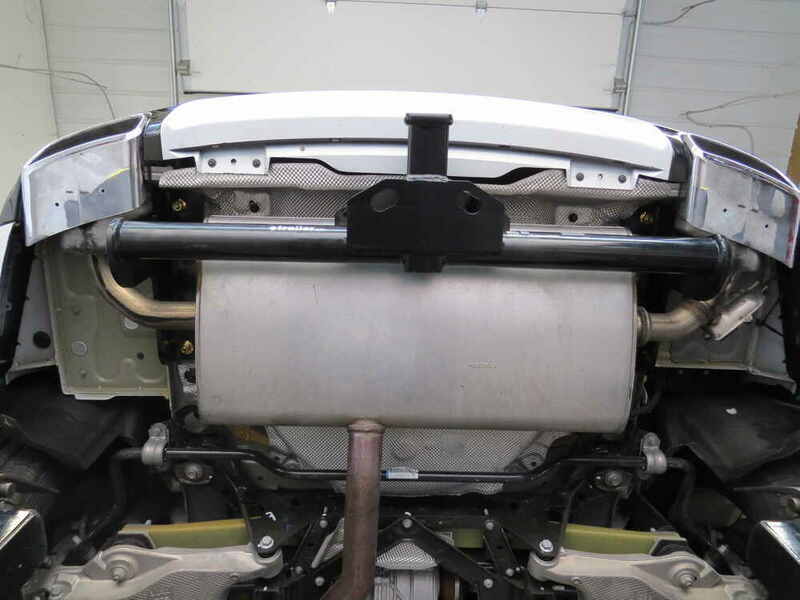 According to their instructions, there is heat shield trimming required and skid shield trimming if present, but there is not any bumper or facia trimming required for this installation. I've attached the installation details for you. You will want to note that for any non-trailer load, Curt requires the use of a stabilization strap # 18050. 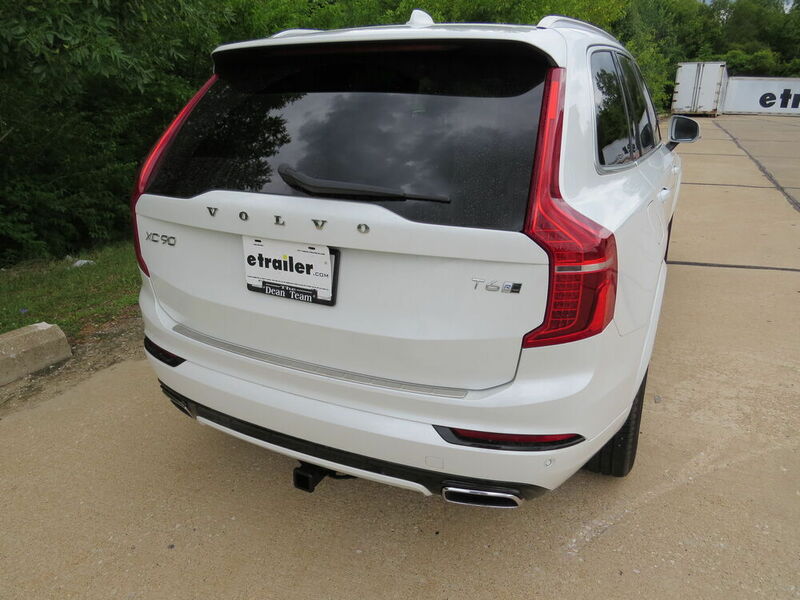 I spoke with my contact at Curt about how far down the # C13233 trailer hitch hangs on the Volvo XC90. 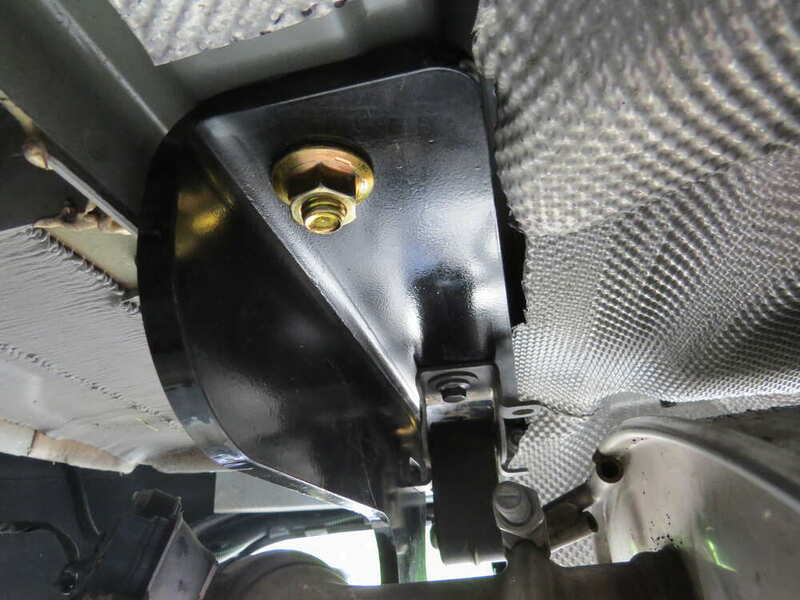 He said that the trailer hitch measures approximately 10-5/16 inches from the bottom of the frame-mount bracket to the bottom of the hitch receiver. I have attached a diagram showing this measurement. 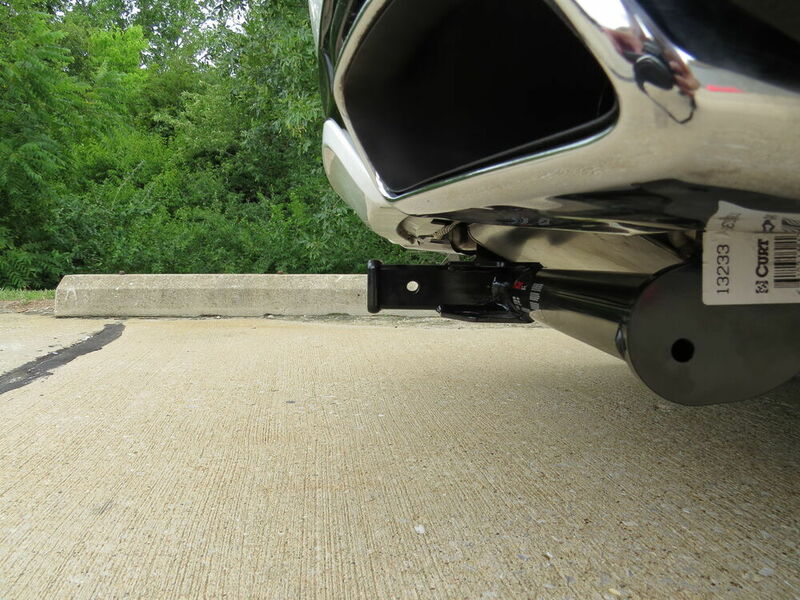 To determine how this will effect your ground clearance, you can measure from the mounting location of the hitch down. This will give you an idea of where the hitch will sit on your vehicle.